The kit includes the pattern, fabrics similar to those shown in the cover quilt, to make the top and binding, and floss for the embroidery. You supply backing fabric. New! 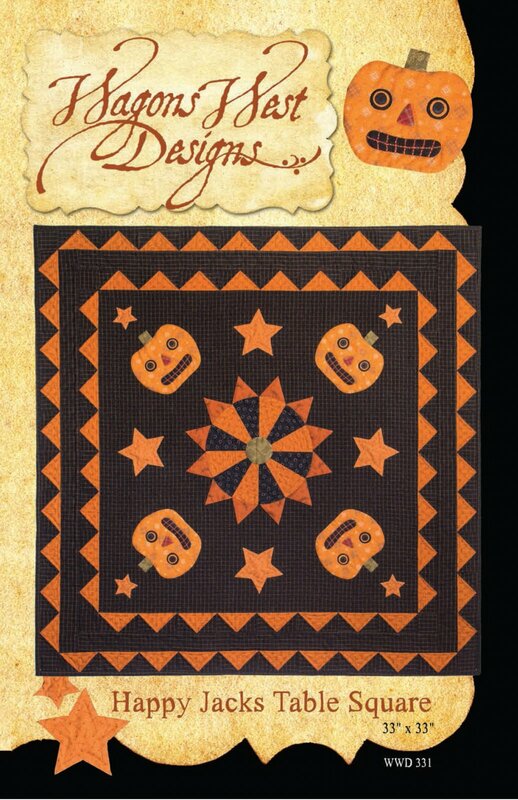 Happy Jacks Table Square is 33" x 33", a folk art inspired addition to your Halloween decor. The Happy Jacks Table Square features four grinning jack-o-lanterns and stars surrounding a center wheel. Applique and a little embroidery with a pieced double dogtooth border. Full size applique placement diagram included, along with excellent diagrams for ease of construction. The kit includes the pattern, fabrics similar to those shown in the cover quilt, to make the top and binding, and floss for the embroidery. You supply backing fabric.